It is Choclette’s We Should Cocoa time again, hosted this May by the lovely Karen of Lavender and Lovage! I totally know Karen. Ok, not really, but I do feel like I do, as I “met” her on Recipezaar (ah, memories!) years ago and have followed her cooking adventures online ever since. (Her blog also convinced me to try the 5:2 diet, which is the only bloody diet I have ever been able to stick to with any consistency. Yay! But no more talk of diets, for it is time to talk sweet sugar: ) The theme for this month’s challenge is a classic: vanilla. Chocolate & vanilla. It’s a wonderful combo that tastes good, smells good, and looks good. 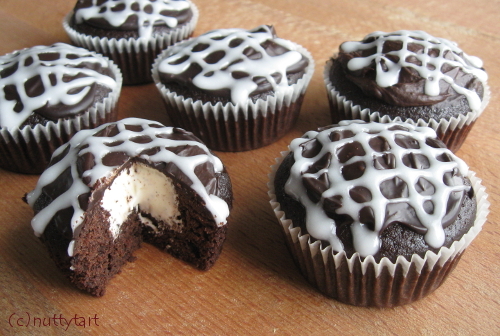 For my chocolate and vanilla combo recipe, I decided to fill dark chocolate cupcakes with a creamy, fluffy filling. I used vanilla paste in lieu of extract. The exotic reason for this was that I was out of extract but had paste. Ta-dah! The paste I use is equal in strength to extract (apparently they can vary), so you can substitute vanilla extract in equal measure. Also, I near-completely failed at the ganache. I forgot to cover the bowl so most of the heat evaporated before all the chocolate had melted. I tried to salvage it the best I could (I had used the last of my chocolate and cream), but the end result was a little lumpy, as you can see from the photo (still delicious, though!). Thou shalt not make my mistake, but produce beautifully smooth and satiny ganache instead, so thou shalt! This recipe makes 6 cupcakes – as always, it’s a small batch as there’s only TLSO and me, and we’re trying to stay human-shaped! The recipe should, however, double without problems to make 12 cupcakes. To make cupcakes: Preheat oven to 175 C. Line six cups of a 12-cup muffin/cupcake pan with paper liners. In a small bowl, combine cake flour, baking soda, and salt. Set aside. Place chopped chocolate and cocoa powder in a bowl; pour the hot coffee over them. Cover the bowl and allow to sit for 5 minutes. Stir until smooth and allow to cool to room temperature. Add light brown sugar, oil, egg, vinegar, and vanilla paste to the chocolate mixture and whisk to combine. Add the flour mixture and mix until smooth. Divide the batter between the lined cups. Bake in the preheated oven until just done, about 15 minutes. Allow cupcakes to cool completely. Cut the centres out of the cupcakes (about 2/3 of the way down) using a cupcake corer, or any instrument that you can think of that makes a hole about 2 cm across. Make a cup of tea and eat the cupcake cores. Pipe the filling into the holes of each cupcake – you can simply use two teaspoons too. Scrape off overspills so the tops remain smooth. To make ganache: Place chopped chocolate in a small bowl. Gently heat the cream in a small saucepan over low medium heat. As soon as the cream starts to boil, pour it over the chocolate, cover the bowl, and let sit for a few minutes. Whisk until smooth, and allow to cool for about 15 minutes. Drizzle or spread the ganache on top of each cupcake – dipping each cupcake top into the ganache will, of course, give the neatest result, but will be challenging as there’s not a whole lot of ganache in which to dip! As long as you manage to transfer the ganache onto the cupcake tops, you’re golden. Transfer the cupcakes into the fridge to set the ganache. Once the ganache has set, decorate with a simple white icing (100 ml powdered sugar + 1 tablespoon water) or melted white chocolate.